It’s hard to believe it has been 22 years since the first Jurassic Park hit movie screens around the world, reigniting fear and wonder of the mammoth pre-historic reptiles who once ruled the planet. Now with Jurassic World taking the title of having the biggest domestic opening weekend in box office history, it’s time to take a look back at the film that started it all and 20 things you probably never knew about the groundbreaking film. 1. The movie may have a run time of 127 minutes but there are only approximately 15 minutes of dinosaur footage. 2. Christina Ricci auditioned for the part of Lex. 3. If you look closely, when Nedry communicates with the dock via webcam, it’s just a Quicktime video playing on screen. 4. Thanks to the rain, the animatronic T-Rex began to routinely short circuit and ‘come alive’ on its own. 5. Stars Jeff Goldblum and Laura Dern found romance on-set and were engaged after Jurassic Park. Unfortunately after two years the pair broke off the engagement and split up. 6. The scene in which Sam Neill’s character, Grant uses a flare to get the T-Rex’s attention ended in injury. “It dropped some burning phosphorous on me and got under my watch and took a chunk of my arm out.” he said. 7. Not wanting to put a very young girl in a life or death movie situation, director, Steven Spielberg reversed the ages of the children. In the original novel, Tim is the older sibling, so he made Lex the older sister to Tim. 8. The rippling effect in the cup of water during the film’s iconic T-Rex is coming scene was made by strumming a guitar string that was attached under the dashboard beneath the glass. 9. The T-Rex sound effects were a combination of an elephant trumpeting, penguin mating sounds, as well as dog, tiger, and alligator noises. 10. When T-Rex comes through the roof of the Explorer, the child actors’ screams were real, as the glass wasn’t meant to break. 11. The original script for Jurassic Park 4 involved genetically engineered dinos who could be trained to carry weapons and take part in battle. 12. While filming on location in Hawaii, Hurricane Iniki—the most powerful hurricane to hit Hawaii in recorded history—happened. 13. While Steven Spielberg enlisted paleontologists to consult on the film to make sure he wasn’t straying from real-life evolution, he didn’t always take their advice. 14. Once filming wrapped, Spielberg hired on George Lucas for post-production responsibilities so he could turn his attention to working on his next film, Schindler’s List. 15. 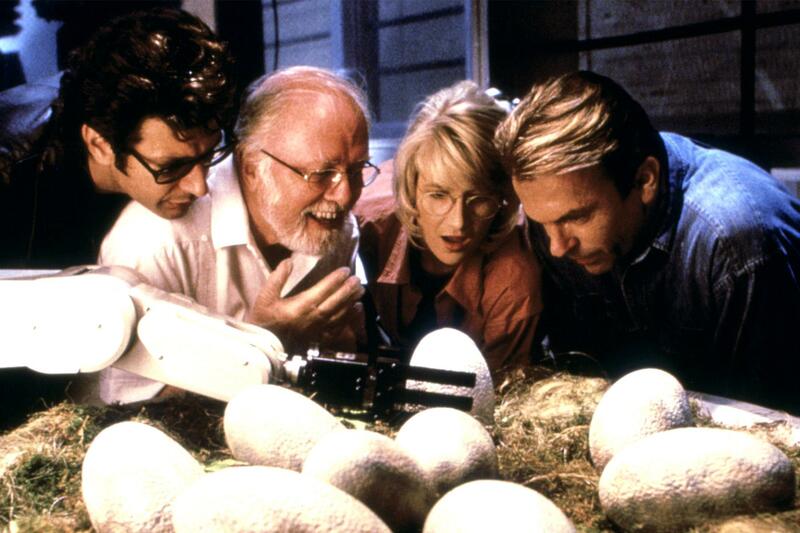 Spielberg learned about author Michael Crichton’s Jurassic Park idea before the 1990 book was finished and won the film rights before it was even published. 16. Nicolas Cage played a pivotal role in Laura Dern’s decision to be in the movie. 17. It took seven puppeteers to operate the eyes, mouth, stomach and other body parts of the sick Triceratops. During filming a puppeteer was hidden in the tail of the giant dino. 19. Screenwriter Davis Koepp says the idea of animated Mr. DNA was the direct result of a sarcastic comment.